As more and more people discover the opportunities for exercise and enjoyment that come with the outdoor sport of mountain biking, more riders have become interested in ways of improving the performance of their bikes and taking things to the next level. 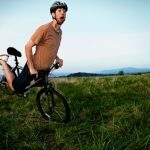 While it is perfectly possible to have a great time with a stock mountain bike without wanting anything more, sooner or later you might find yourself interested in different upgrades that can affect the way your bike performs when you are out on the trail or bombing down hills in the woods. A good way of upgrading your mountain bicycle is by changing the stock fork that came attached to your bike. Today it is common to find mountain bike forks that come with technical suspension systems so the bike can handle and maneuver better when the terrain becomes rougher, wetter, rockier, or muddier. The different kinds of forks that can fit mountain bikes are classified by the types of technology they use. Examples of bike forks available as upgrade options for mountain bikes are Jump suspension forks, 4x forks, freeride mountain suspension forks, cross country suspension forks, freeride downhill suspension forks, and Cannondale lefty forks. Every suspension fork category will offer its own unique pros and cons, and each will perform best in specific conditions and on specific terrain. An important part of a suspension fork that you should keep in mind when shopping for upgrades is the suspension travel; the suspension travel refers to the amount of distance a suspension coil can move from when it is fully compressed to when it is in its resting position. This article will discuss some of the different upgrading options you can consider for your mountain bike fork. The first kind of mountain bike forks to keep in mind as upgrade options are 4x and jump forks. These forks are typically coil sprung and designed to have a short amount of suspension travel. They are made to help cushion a heavy landing while you are out on the trail without an extreme amount of compression in the front end of the bike. This allows you to recover pretty quickly while you are on the bike and get on with your ride. 4x and jump forks are stable and the amount they weigh is usually related to their durability; heavier forks will tend to last you longer. In general, they are the most sturdy suspension forks you are likely to find. The second kind of mountain bike forks to keep in mind as upgrade options are mountain suspension or freeride lite forks. These forks are designed to have more suspension travel than cross country forks, and they typically top out with about 6 inches of travel. As you might expect, they weigh more than other types of forks, which makes it even more important to have a good lockout system for them. With mountain suspension forks, it is more common for riders to use forks that are coil sprung instead of forks that are air sprung. The weight of the coils adds to the weight of the forks but lends them greater durability and capability of handling more strenuous impacts. The third kind of mountain bike forks to keep in mind as upgrade options are downhill or freeride forks. Thee forks are also known as double crown suspension forks due to their design, and it is common to have up to 10 inches of suspension travel with these forks. As with mountain suspension or freeride lite forks, thes eforks typically come with coil springs to add to the sturdiness of the riding experience. You can also customize the feel of your rides up and down slopes by changing the springs included in the fork’s suspension system. When you change the springs you change the suspension travel of the system, which also influences the way the bike will handle in different trail and hill conditions. You might be tempted to use downhill forks in cross country bikes so you can take advantage of their shock absorbing power, but you should not do so because cross country bikes are typically not made to support the pressure a freeride fork can easily deliver.